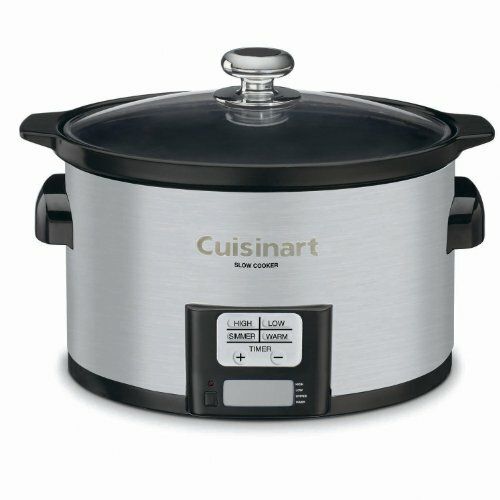 Top Five Mid-Priced 2-4 Quart Slow Cookers , or take a look at high end small quart slow cookers. Pick a price range that meets your needs, and cooker that will look great in your kitchen! This programmable slow cooker has a flat digital panel with one-touch controls. There are two high and two low cook settings, which automatically shift to the warm setting once the selected cook time is up. The crock is made of stoneware and the lid is glass, both of which are dishwasher safe. The black appliance is oval shaped and comes with a limited one-year warranty. Although some higher-end cookers provide more customization when it comes to programming, the Smart-Pot limits your cook-time selections to four, six, eight or ten hours. This means you’re out of luck if you want the appliance to automatically stop simmering at a different increment, but given the budget-friendly price point, this model is a good pick if you’re looking to find a compromise between features and cost. With this digital cooker, you select your desired quart size, cooking time and heat setting–high, low or warm. The LED display on the control panel counts down the remaining time before shifting to warm so you don’t have to worry about anything. The oval cooker comes with a stoneware crock for dishwasher-safe cleanup, a clip-on lid for secure travel and full-grip handles for easy carrying. 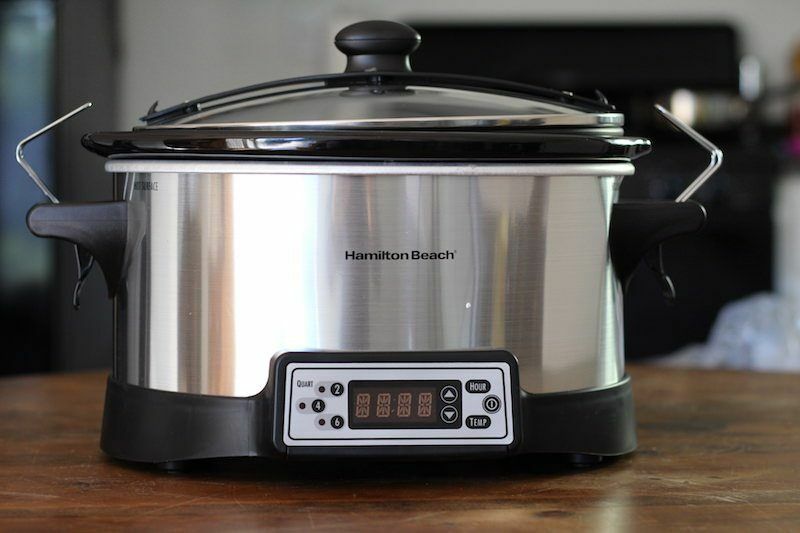 Since this model from Hamilton Beach is designed to accommodate different quantities of food based on your changing needs, the cooker has programmable settings for two-quart, four-quart and even six-quart meals. 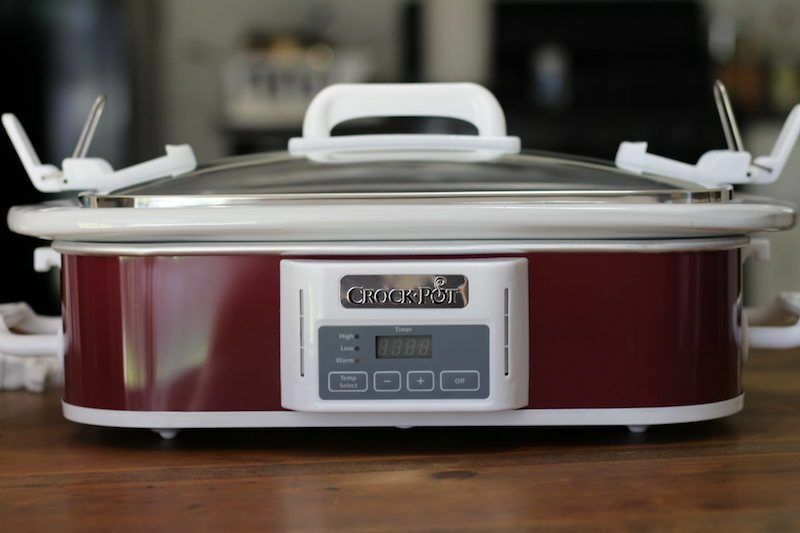 The inside of the crock is marked so you’ll know what setting to choose, prompting the cooker’s internal temperature to automatically adjust based on the quantity of food being cooked. The existence of a six-quart feature may be a drawback to some since it causes the cooker to take up more kitchen space, but the versatility offered is a real plus if you’re afraid that a traditional four-quart cooker may occasionally be too small for your needs. 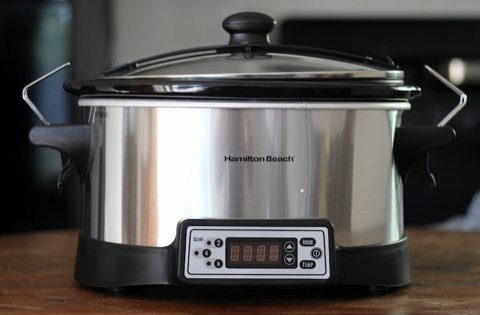 This slow cooker system consists of two interlocking appliances, which can be used alone or joined together. Each cooker houses a stoneware pot that can hold up to two-and-a-half quarts of food and can be set, with a manual dial, to low, high, warm and off temperature settings. The cookers each have recessed handles, a spoon notch to rest a serving utensil and a metal lid rest to easily keep the lid nearby in an organized way when it’s time to dish up. The crocks and glass lids can be cleaned in the dishwasher. Fans of the cooker system love how sleek and practical the design is. The connectable units can be powered by one outlet and, when not in use, can be stacked on top of each other, which means the appliances look good on a serving table and also save space in the cupboard. Unfortunately, the manual dial doesn’t provide sophisticated settings so you’ll have to keep track of the cooking time yourself. 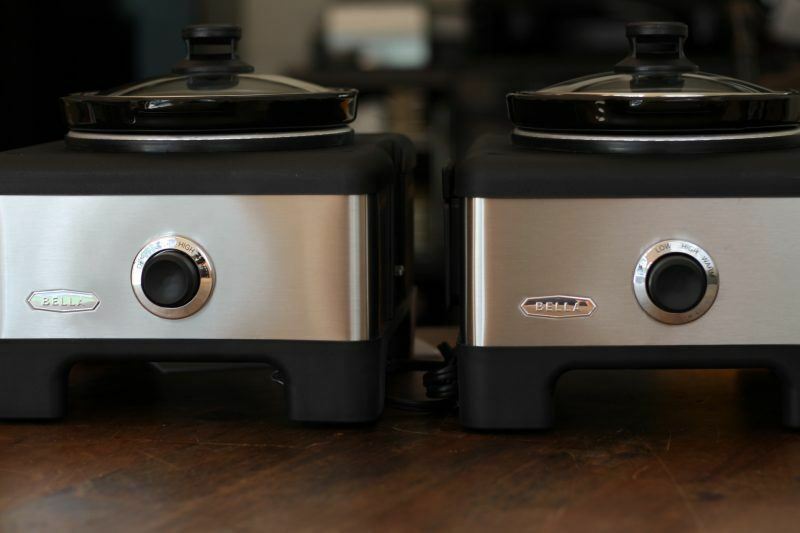 If you’re in the market for two small cookers, ordering this system is practically a no-brainer. Alternatively, if you want to order just one unit, you can pick up the Bella 14012 for $33.00. This Cuisinart cooker features a stick-resistant and dishwasher-safe ceramic pot, a see-through glass lid and a stainless steel housing with cool-touch handles. There are four cooking modes–high, low, simmer and warm–and the LCD countdown timer can be set for up to twenty-four hours. After the cook time has elapsed, the appliance will automatically shift to warm and, after an additional eight hours, will automatically shut itself off. Consumers love that every feature, right down to the non-slip rubber feet, looks built to last, which is part of the reason why this model is consistently ranked among the best-selling slow cookers. The crock capacity is on the small side, but the oval appliance is still great for couples and singles. If you’re interested in using a full day for the cook time, this appliance can’t be beat. This rectangular slow cooker is perfect for cooking casseroles, lasagnas and desserts. Using the control panel, you can select a low, high or warm temperature and a cooking time anywhere between thirty minutes and twenty hours. The removable stoneware is actually oven safe, which means you can have crock-to-oven or oven-to-crock convenience if you want to broil the top of a slow-cooked meal or keep an oven-baked dish at a ready-to-eat temperature for hours. There’s also a secure-fit locking feature on the lid for mess-free portability. 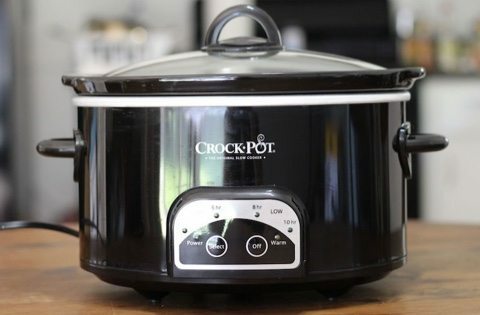 This casserole-shaped appliance is made by Crock-Pot, the original brand of slow cookers, which is one more reason why consumers can’t get enough of this product. The crock design clearly isn’t optimal for cooking a whole chicken or a tall roast, but depending on what kind of meals you personally love to eat, this rectangular pick may serve you well. Of course, if you have extra counter or cupboard space, you may be interested in purchasing a traditional oval cooker as well as this innovative casserole option. 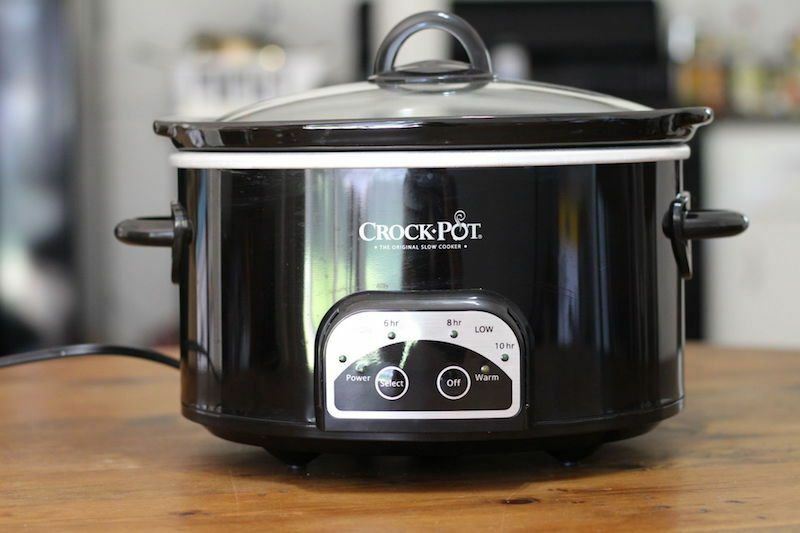 All things considered, we like the Crock-Pot Smart-Pot the best. The sleek design, trusted and reliable brand, and versatile cooking options make it our #1 choice. 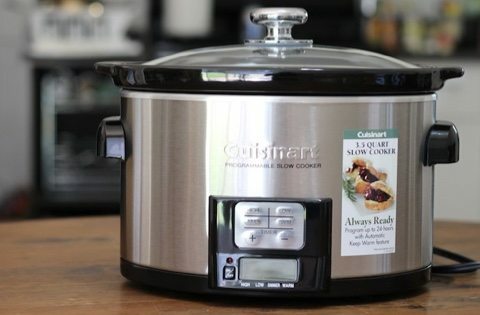 Our second favorite was of course the Cuisinart PSC-350 Programmable Slow Cooker best. We love the brand, we love how many favorable reviews there are for this particular model and we love the customization offered in terms of cook time and heat settings. For a mid-range product, Cuisinart definitely has our vote. Whether your hectic schedule keeps you away from home during the day or just otherwise-occupied inside the house, you don’t have to give up on the idea of having healthy, allergen-free and yummy dinners served warm. With any of these electrical countertop appliances, you can produce gourmet meals with little effort on your part. After tossing your ingredients into the crock in the morning, you won’t have to think again about dinner until it’s time to dish up. Life doesn’t get much better than that!